Stepping Stones Group Limited is a family business with over 25 years’ experience in the childcare sector. Our journey began with Crèches and Soft Play Adventure Centres, and then in 1996 we were delighted to open our first children’s Day Nursery enabling us to enhance the quality of our childcare provision even further. Since then, our nursery group has grown organically and we are now proud to deliver excellent childcare in nine nursery settings across the North of England, where our highly skilled teams play a vital role in the learning and development of children in their early years. Within our group we are very fortunate to have our own in-house training specialists, the Childcare Development Team, who are experts in their field and provide specialist training and support to each of our settings regularly to help drive continuous improvement and development at every level. At Stepping Stones, we recognise the importance of everything a child experiences from birth to age five and the impact this has on their future, so we work hard to ensure the learning opportunities we provide for each individual child are of a high quality that enriches their early childhood. We believe in giving children the best possible start in life and we make it our mission to support parents and carers every step of the way. Family is important to us and we understand the challenges parents face when it comes to making decisions about childcare, so we do everything we can to help that process and we pride ourselves on making sure new families, as well as new team members, feel welcome from the moment they walk through the door. 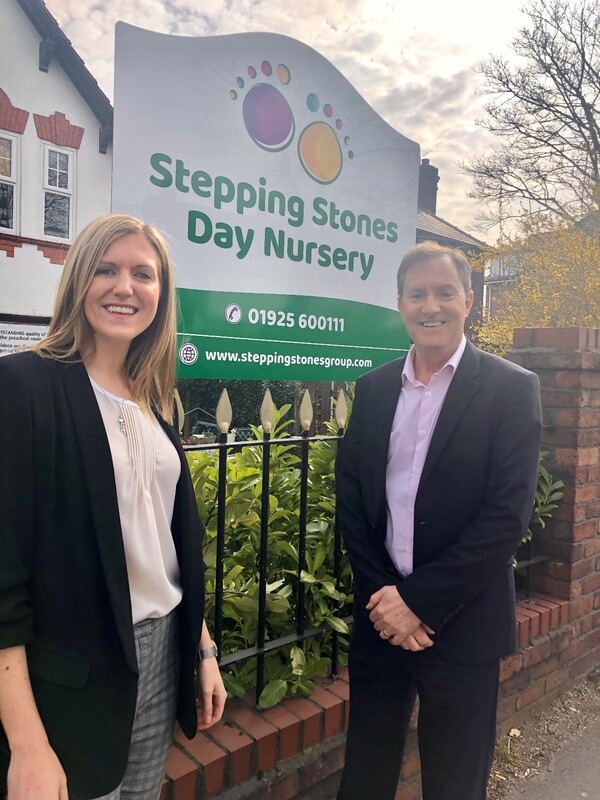 Pictured are our company directors, Olivia Couture and her father Neil Ritchie, standing in front of our Stockton Heath nursery. At Stepping Stones, we strive to deliver High Quality Care for all our children. We are Passionate about the learning and development of each individual child in our care, and we are committed to Inspiring the future generation.